Preheat oven on 350 degrees. Mix all of your ingredients in a bowl. NOTE: When adding in your add-in ingredients, eye the amount you use. Do not put too much of one thing in - I just used some small handfuls of each. Use a tablespoon and spoon out some cookie dough onto a greased cookie sheet. Use a fork or toothpick - oncee you put in the center of the cookie and there is no dough - bon appetit! These cookies are wonderful and delicious! They are better warm - but all cookies are always better warm! Hubby & his friend absolutely fell in love with them. My favorite part?? That they are so simple, yet so delicious!! And, to me - the less ingredients - the better!! Let me know what you think when you try them out! 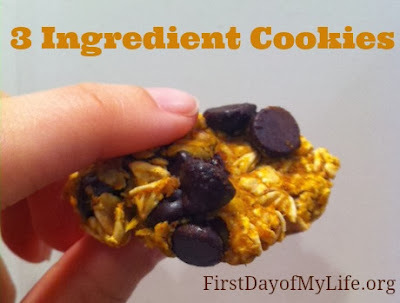 This recipe was adapted from the 2 Ingredient Autumn Cookies I found on Pinterest. easy peasy! love it!! i adore sweet simple little recipes like this! These look delicious, Cami. I'm going to try them this weekend. Yummy. I just love Pinterest, don't you??? Oh, these look delicious, and have all of my favorite ingredients in them.